Willow Valley's John Freeman and Royal Cromer's Alex Mournian. WILLOW Valley’s John Freeman drew on his previous experience of playing in the England Golf senior men’s North tournament to triumph at Harrogate GC. 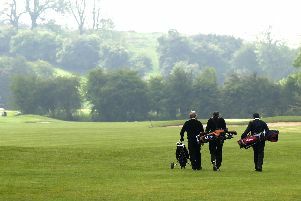 He finished six points ahead of the field in the men’s handicap event, while Norfolk’s Alex Mournian won the women’s handicap prize by five points, helped by an eagle. The scratch winners were Durham’s Michael Baker and Northamptonshire’s Carol Gibbs. Freeman, a 13-handicapper, scored 74 points (39 35) and was motivated by his experience on the previous occasion he entered one of these events, at Pannal in Yorkshire, and was thwarted by the weather. “I had told myself [on that occasion] ‘you can’t win it in the first round, but you can lose it, so play nice and steady’,” he said. “I got 37 points and was two or three back, nicely placed – but the second round was totally washed out. It proved to me you can win it in the first round. He made a perfect start with a birdie on the first hole and then played steadily throughout the two rounds, taking advantage of a hot putter over the first 18 holes. Freeman took up golf when he was in his thirties but had to give up the game for 14 years because of arthritis. A new hip and a new knee meant he was able to take up golf again when he retired and his aim is a single-figure handicap. Royal Cromer’s Mournian was taking part for the first time, having “discovered” England Golf events when she, her husband and another couple played in the new, mixed Club Team championship and reached the national final in Golf Week at Frilford Heath. Mournian, who is in the RAF, said: “I noticed the poster in the locker room, realised I qualified and thought I’d enter as I come from Yorkshire and could also see family. It’s been thoroughly enjoyable and the club were fantastic. The highlight of her tournament was an eagle two on the par-4 first, in the second round, where she holed her wedge shot. “The other two ladies had played first and both went through to the back of the green, so I was trying to keep the ball short and let it run up to the hole. I had put my club back in my bag when, all of a sudden, the ball disappeared into the hole. She amassed a total of 67 points with rounds of 34 and 33, playing off 14 handicap. The scratch winners also succeeded by big margins. Carol Gibbs (Wellingborough) had 56 points and won by six; Michael Baker (Chester-le-Street) had 61 and won by four.